An easy and delightfully delicious milkshake that tastes like funfetti cake with a fraction of the calories. Birthdays are week-long celebrations for me. Heck, they should really be month-long, am I right? Regardless, I’ve been hyping up my birthday all week on my blog but TODAY is the real deal. 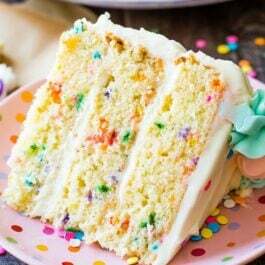 And I must post a funfetti recipe on my birthday, right? I chose to put sprinkles in a milkshake last week. A little afternoon treat pumped up with rainbow sprinkles and accessorized with colorful straws. The milkshake is made from bananas. Whipped bananas, to be exact. Have you ever whipped bananas before? It’s simple. Take a bunch of ripened bananas (super ripe), peel them, slice them, and freeze the slices. Blend the frozen slices together and you have 1 ingredient dairy-free, sugar-free, gluten-free, and guilt-free ice cream. Mix it with some vanilla extract and it really tastes like vanilla soft serve! For my funfetti milkshake, I added 1/4 cup of vanilla Greek yogurt and 1/4 cup of vanilla almond milk to the banana whip. You may use regular yogurt and regular milk instead. The yogurt makes the milkshake extra creamy and the almond milk thins it out so it’s drinkable through a straw. Since I added yogurt, the milkshake is no longer vegan. Feel free to use soy yogurt instead. I added 1 teaspoon of vanilla extract to the milkshake as well. Oh! And let’s not forget about the sprinkles I added too. 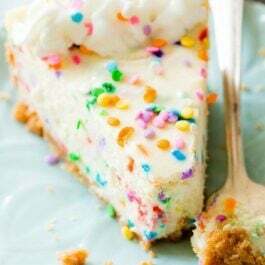 Always sprinkles. This milkshake is miraculous. It doesn’t even taste healthy. The milkshake has a *very* slight banana taste. If using vanilla greek yogurt, vanilla almond milk, and the vanilla extract — you will mask most of the banana flavor. Make sure the bananas you slice and freeze are extra ripe. Practically all brown. The more ripe your bananas are, the better and creamier your milkshakes will be. 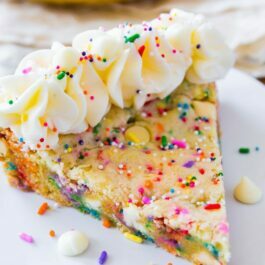 A creamy, thick vanilla milkshake that tastes like funfetti cake with a fraction of the calories. 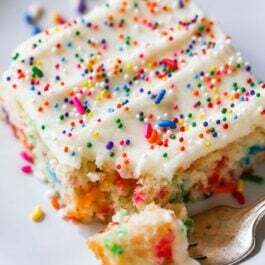 Sprinkles might bleed their color. Do not stir them too vigorously into the milkshake.